I must start by saying that I am a huge fan of the film “Elf” starring Will Ferrell. It is a classic Christmas film that many people enjoy year after year during the festive period. As seems to be the case with popular movies nowadays this has now been made into a musical that opened initially on Broadway and has now transferred to the West End for a limited 10 week run. First up I have to get it out there, this show is expensive!! It is the most expensive show currently on the West End with adult tickets starting at around £80 if pre-booked. I managed to bag a slightly cheaper ticket by turning up at the box office on the day and seeing what they had left. The set is bright and fun with props and lighting used to great effect. Santa’s sleigh was particularly clever and probably partly explains the extravagant prices. The songs are easily forgettable but are upbeat enough to be enjoyable. There was a song, delivered by a group of downbeat Santas, which was satirical and engaging which was a personal highlight for me. Ben Forster (winner of the BBCs search for Jesus in Jesus Christ Superstar) plays Buddy the Elf who goes to New York to find his father. He is loveable as the protagonist with an impressive vocal range and tone throughout. He was backed up by a strong and tightly drilled chorus however I was not so impressed by the other principle parts including Kimberly Walsh who was a very one-dimensional Jovie. She had none of the cutesy charm Zooey Deschanel brought to the role in the film. The script was surprisingly weak. With such a strong source material I was expecting great things from this however it ended up feeling almost like a pantomime. There was slapstick humour for the kids and double entendre for the adults but none done well enough for full-blown enjoyment from either party. It just seemed a bit confused as to what it wanted to be and who it was aiming for. Don’t get me wrong, I had a good time and am happy I got to see it. It would make a great family day out, if you have the funds to take the whole family that is. I do not feel it justifies the extortionate price tag and there are better childrens’ shows out there such as Matilda, The Lion King, Shrek and I have heard good things about Charlie and the Chocolate Factory. If you want a bit of festive fun though you could do much worse than this show. 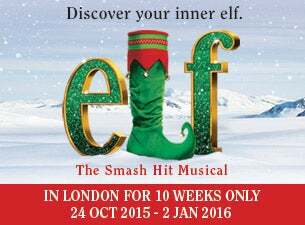 Have you seen Elf the Musical? What did you think? Have you seen anything recently that you were slightly disappointed by? Wildlife Photographer of the Year Awards.